Pick a song and press play. I will now tell you that you won’t rain on my parade, that you, and you, and you, you’re gonna love me, that this nearly was mine, that wild is the wind, and that the strings of my heart go ‘zing’. Speak Low is a durational performance for one audience member at a time. 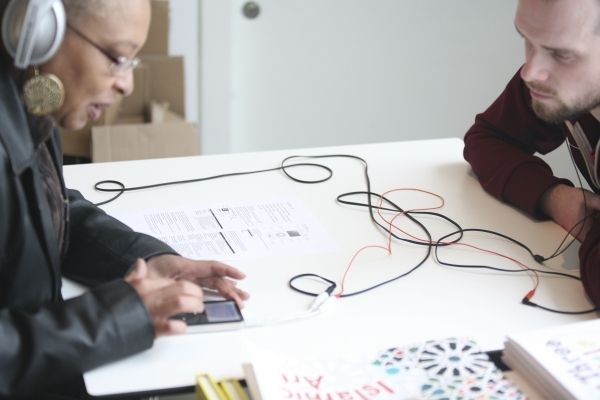 An MP3 player is placed on a table with two pairs of headphones connected to the device; one for an audience member and one for the performer. Individual audience members are invited to put on the headphones and pick or randomly play any of the hundreds of songs available. The performer will then mime the words along to the music, replicating the exact phrasing and intonation but will not attempt to sing. As the song will only be audible to the audience member and the performer, the piece attempts to create a temporary and fleeting encounter between both parties, albeit one that is genuine, sincere and unforced.